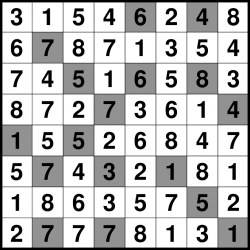 In a Hitori puzzle you start with a full grid and must eliminate numbers by shading them in so that no number occurs more than once in any row or column - conceptually it's a little bit like Sudoku in reverse, but in practice the logic required to solve the puzzle has very little in common. 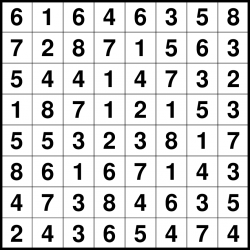 In particular there is no requirement to have each number occur at least once in a row or column (which would not be possible in a Hitori puzzle with a unique solution in any case). 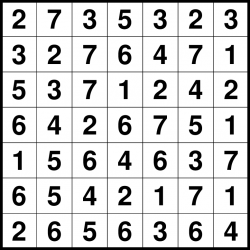 There is only ever one possible solution to any Hitori puzzle, which can always be reached via reasonable logical deduction. In a proper puzzle every square must be forced to be either shaded or unshaded (white or black) - in some inferior copies of the puzzle this requirement is not obeyed, so beware of pale imitations! Guessing is never required. 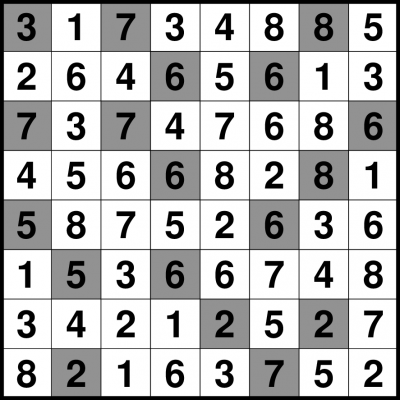 Because many arrangements of numbers form technically-valid Hitori puzzles, you may have come across poor Hitori 'puzzles' that actually require no thought to solve (or conversely are ridiculously tricky). 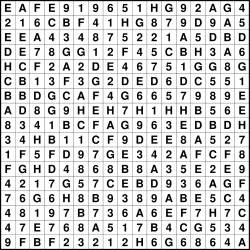 None of our puzzles are like this - we seed puzzles by hand with interesting layouts that ensure interesting (but not insanely-tough) logic is needed to reach the solution. 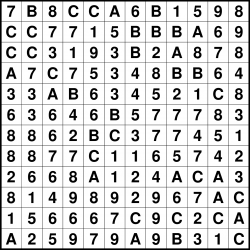 We can supply Hitori puzzles at a range of sizes and difficulties.